Last May 5, a local court in Temuco, Southern Chile, sentenced Luis Tralcal Quidel, José Tralcal Coche and José Peralino Huinca on charges of terrorism for setting fire to a large-estate house in 2013 - its owners, the Luchsinger-Mackay couple, who were in the premises at the time, died as a result. This was the second time the case was in the courts: in October 2017, the appeal court in Temuco had absolved eleven defendants of any crimes and dismissed the charges of terrorism. The three men now sentenced to life imprisonment have already spent quite some time in jail as a result of both this and previous trials, most of them on charges of terrorism. Luis Tralcal, in particular, has been brought to court on nine occasions and even though he has been acquitted each time, he has spent several years in “preventive custody”. All three are community activists who have been leading local struggles for the restitution of Mapuche territory. They consider themselves defenders of land and water and they fight for the preservation of the Wallmapu (the ancestral Mapuche territory) from extractivism, predatory economics and grasping ways of life. Like many of their peñis (brothers and sisters) before them, they have been persecuted, harassed and intimidated by the country’s powers that be: the central government and its local branches, the judiciary, the police, and the mainstream media. Like many of the previous trials of Mapuche activists, this one has been irregular since its very beginning. The fact that the Mapuche conflict has intensified in the last few years has led the Chilean State to turn it into a show trial and present the Luchsinger-Mackay case (undeniably a terrible event) as an emblematic case of "Mapuche terrorism" - despite all the evidence against, it has applied the “Counter-Terrorist Act” to the defendants. On the day after the event, El Mercurio carried an article under the headline “The tough guy of Vilcún” suggesting that Luis Tralcal had played a leading role in the increase of “violent actions” in the area. The main evidence against the defendants is Peralino Huinca’s first declaration of 2013, in which he testified against himself and ten other Mapuche defendants, without the presence of his attorney. He later retracted this declaration and claimed that he had signed it under torture and other unlawful forms of coercion such as being offered money and special protection, which he refused. There is no record in video or audio of the alleged confession, only a written document in a far more sophisticated language than Peralino’s. His second declaration, in which he qualified the content of the first one as “pure lies”, can be watched here. Psychological tests conducted under the Istanbul Protocol confirmed that Peralino's first declaration was made under duress. Security operations carried out on the margins of the law are part of the Wallmapu’s everyday life. A group of high-ranking Carabineros (Chile’s uniformed police) are currently on trial on charges of illicit association in relation to the undercover Hurricane Operation, a massive hoax against Mapuche activists. Having found no evidence against the suspects, the Police Intelligence Unit (UIOE) developed a system to intercept text messages to and from the electronic devices of ten suspects, to be used as evidence – a procedure which was consented by a Judge of the Temuco Court. A special parliamentary commission conducted an enquiry into the UIOE operation, and yet the same UIOE produced guns and pamphlets as evidence in an early version of this trial. What is more, it was recently disclosed that two of the judges (out of three) in the bench trial were, and still are, applying for government jobs - which is a blatant conflict of interest, since the government is a main plaintiff in this case. The third judge (a woman), who had kept observance to due process, withdrew on medical grounds from the trial a few days before the verdict was made public for alleged workplace harassment. To this should be added that the main plaintiff’s witnesses were some of the largest agro-business producers in the area. The chain of events leading to the current trial started around the 2017 absolutory sentence, as a sort of backlash - in fact, a reactivation of the colonial offensive by Chile - corporations, State, and media - against Mapuche defense of their territory and culture. In September 2017, under Michelle Bachelet’s government, a meeting was held between the judges of the region’s courts and the high ranks of the police, prosecutors, and government authorities. A week later, the Chilean Home Vice-Secretary Mahmud Aleuy visited his Argentine colleague in Buenos Aires, giving a transnational dimension to the conflict. The Chilean State’s persecution of Mapuche grassroots leaders and spiritual authorities has been condemned by different organizations such as Chile’s National Institute of Human Rights (INDH), the Inter-American Human Rights Court, the European Humanist Forum, and many others. In a number of occasions (e.g., in its report and a few weeks ago), the INDH - which is an autonomous body, independent from the government of the day - has explicitly declared that the Chilean State has been engaging for quite a long time in actions which violate norms and agreements it has itself adopted - the most important of which, the 1989 International Labour Organization's 169 Convention on Indigenous and Tribal Peoples, which was signed by Chile in 2008. The ILO 169 Convention is widely considered to be the main international tool for indigenous rights. It overrides in some important issues previous assimilationist legal provisions, to the extent that it recognizes the inalienable nature of native collective rights, including the right to economic and political self-determination. It also establishes the right to consultation in case of conflict, particularly in matters where agro-business and mining interests are involved. It mandates that human rights be specially observed in indigenous conflicts, and advises authorities against penal sanctions and even the use of ordinary justice in these cases. In 2014, the Inter-American Court of Human Rights (IACHR) issued a ruling in the case Norín Catrimán y others vs. Chile. The ruling declared that the Chilean state had violated the principle of equality and non-discrimination, as well as the right to equal protection under the law, in a trial of seven Mapuche leaders under terrorist charges. At that time, 23 of the 26 individuals who were being accused of terrorism in Chile were Mapuche. Turned into law (number 18.314) in 1984, the so-called “Counter-Terrorist Act” was an important tool to facilitate the crushing of the opposition to Pinochet's dictatorial regime. It was based on the so-called National Security Doctrine, a set of principles put forward by the United States in its attempt to dominate the hemisphere in the aftermath of the Cuban revolution, which proved to be crucial, particularly for the military through the School of the Americas, in defining the “internal enemy” – namely, Marxists, Communists, radical leftists and other destabilizing elements. Within that framework, Mapuche struggles were soon pigeonholed as terrorist activities. Terrorism charges allows the authorities to keep suspects for long periods of time in what is euphemistically called “preventive custody", which is something the IACHR in 2014 ruled highly discriminatory. It also increases the sentences twofold, permits and actually encourages “faceless witnesses” and compensated informants, and imposes a number of restrictions to the defendants' attorneys for reasons of secrecy and “national security”. Before the judicial sentence last May, the two only convicted persons on terrorist charges related to the Mapuche conflict were actually police covert agents. In Chile, the Counter-Terrorist Act” has never been seriously questioned, not to say challenged, by allegedly progressive governments in post-dictatorship times. Today, right-wing president Piñera has acknowledged the need to and put forward a proposal for “perfecting it”. But almost in the same breath, Piñera has made public the intention of withdrawing the country from the ILO’s Convention. For the human rights advocacy groups operating in the Wallmapu, the last sentence of the Luchsinger-Mackay trial is clearly a show of force by corporate powers defending investments in the region. According to them, this is the actual reason for the political pressures upon the justice system from successive Chilean governments - which, it should be remembered, is a plaintiff in this case. The lawful violence displayed and exerted by the police, the justice system and the government is just the lastest episode of the Chilean State acting as a colonial power in defense of large capitalist interests and against those who defend other ways of living and other uses of the land which are based on an alternative epistemology that has survived almost 500 years of annihilation policies and technologies. Today, in Chile, the very same institutions which supposedly stand to observe and protect individual rights show their helplessness to prevent the three Mapuche communards from being condemned to life imprisonment. Their attorney's last resort is to submit an appeal to the Supreme Court to have the sentence annulled, hoping that the high court will be insensitive to the powers that be - the very same occupying powers of the Wallmapu which operate throughout the Chilean institutions. This is not, however, a national offensive but a regional one. In recent years, we have witnessed a frightening increase in murders of environment, indigenous, and other activists in non-urban contexts. According to The Guardian, 116 environmental activists were murdered only in Latin America in 2017, out of a worldwide total of 197. This means nearly four Latin American environment-defenders assassinated every week - 46 in Brazil, 32 in Colombia, 15 in Mexico. Many more activists are currently harassed, criminalized, and threatened with eviction or jail if they do not get on board the “development” train. In Chile, two years after the assassination (which was initially presented as a suicide) of activist Macarena Valdés, the case shows no signs of progression. On the brink of ratification or revocation of the May sentence, the silence imposed on Chile’s public opinion has made it necessary to search for international solidarity. “Declaration under torture is not evidence” and “Tralcal is innocent”are two of the slogans of the campaign. In the videos below, Luis Tralcal says that the Chilean justice “has been incapable of capturing the actual perpetrators” of the Luchsinger-Mackay case, and "From the first day the police knew I wasn’t in that place, for I was in a public place”. On his part, José Tralcal says he was told in jail: “If you want to be left alone, you must stand down and renounce your leadership (…) But I couldn’t. 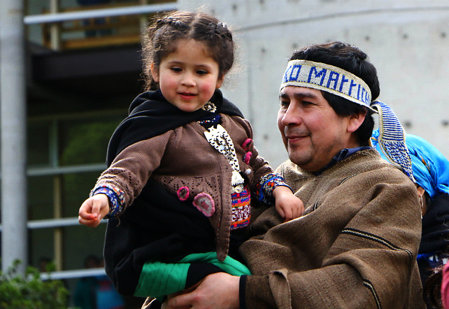 I cannot abandon the Mapuche families in such a vulnerable position”.